Our “Economy twin room” offers a quiet and comfortable place to spend the night during your stay. 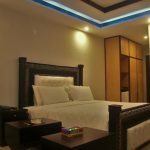 Elegantly designed room with two comfy double sheeted single beds with contemporary wooden design to add a bling of western touch that portrays its higher-end fixture. A well maintained and articulated wooden design of side tables and implanted refrigerator well-selected fine mini-bar is exquisite with wooden cabinet design as its exterior cabinet is in its detailed accordance. For sitting, sofas & chairs are accommodated on each nook of room corners with air conditioner to make eerie/soothing vibe reach to its maximum comfort zone. This well-featured room has various facilities such as functioned cozy plush wardrobe, slippers and other toiletries to name few. Other than that, we have our flat screen TV with cable to zap the channels and DVD players to add up the entertainment. 24/7 HRs Wi-Fi facility with similar span room service is equally provided. For privacy concern, safety deposit box/ locker is built-in for your ease and convenience. Our room is designed in a way to match all your possible needs and exceedingly more than you thought, which is why this hotel was chosen as the best one by award winning “trip advisor”.